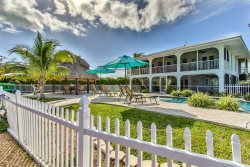 Looks like South Beach Living but in The Florida Keys, this home is completely renovated and ready for your fishing and diving adventures. Fantastic large kitchen and Open Floor plan. Large open deck overlooking the pool and the beautiful canals of Duck Key. 45 feet of dockage, Large pool. Pool heat available. Walk in the front door to beautiful open living spaces, with the kitchen on the right, and dining area that sits 6. Large lounging sofa with pull out for those extra guests. Bedrooms are accessed thru the hall on the right, with the master bedroom on the water side. Master bedroom has a king size bed with a bath on suite. TV and a desk for your work needs. Second bedroom has a hall bath, and has two twin beds. Fishing diving and snorkeling are a short boat ride into the Atlantic Ocean or the Gulf of Mexico. The pictures don't do this home justice. Make your plans to enjoy this beautiful home. 28 day minimum required, no exceptions.